Subjects are based on the content in a given courses. Subjects analytics gives you a high-level view of trends within your team and organization. Spotting these trends can help you drive progress within a given skillset. With this information, you can see if the learning happening within your team is aligning with your business or development objectives. To get started, log in to your Pluralsight account and click on Analytics using the left pane navigation. Next, click on Subjects from the top center panel. Alternatively, you can also navigate from the dashboard widget. Click on Dashboard on the left pane navigation and find the Popular subjects view. Tip: You can filter and segment a specific data set at any time. Use the filter bar to search for a particular subject or get a specific limit on the data showing by using the timeframe drop-down menu. Now that you have some of the high-level views of subject data, click into a particular subject. You have a choice between how you want to see the data. You can choose the user view or courses view. By default, the user view populates when clicking into a subject. The user view will show you the specific learners on your team that have taken courses within a particular subject. 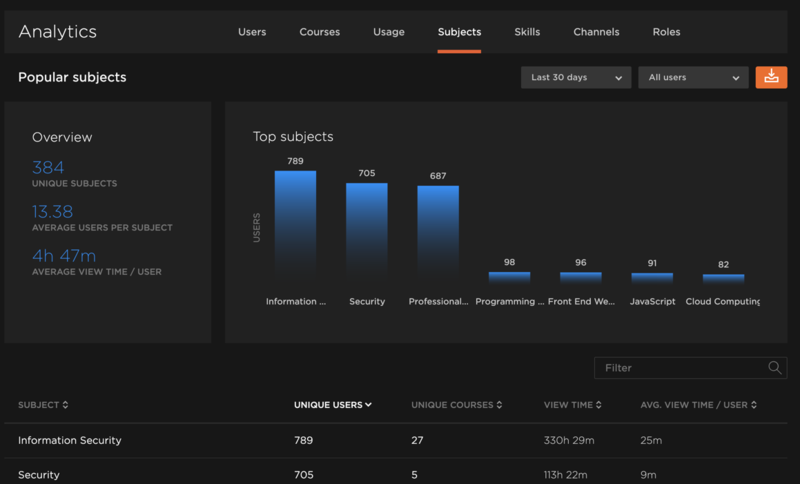 You can view the team they are on, the number of courses they've taken, and the total view time of courses. By clicking the drop down arrow on the right, you can glance at the courses taken related to a subject. This will also show you when your learners took the courses and the view time for each as shown below. Switching over to the courses view, you'll see a collection of trending courses within a given subject. 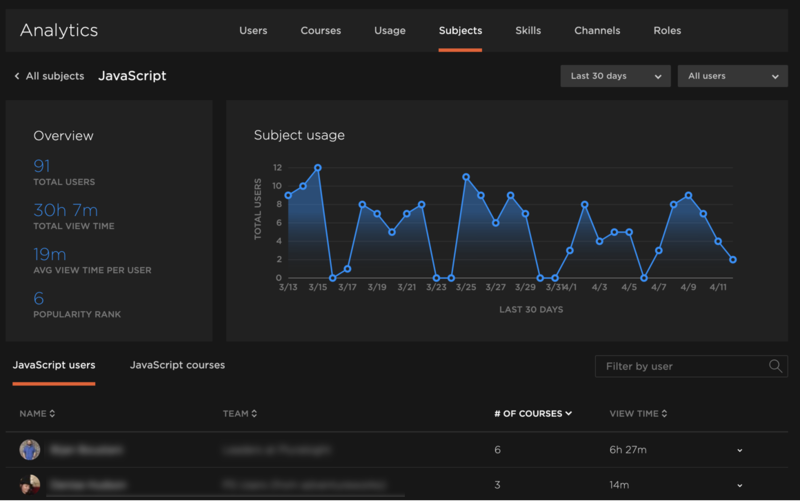 Similar to the users view, the courses view will give you trends relating to a course. In the example above, Angular: Getting Started was the most taken course. This may be beneficial to know so you can stay in the loop with their progress going forward. Using the right drop down will show you a list of learners that took the courses. Tip: If you use our channels tool in combination with subjects analytics, you can create specific channels for a particular subject. This will help target learning within your team and you can track how they're progressing. Question: Does subjects analytics show all the learners on my team? Good question! The data only shows users that are currently active on your group plan. Question: Can a course show up in more than one subject? Yes. Since courses can sometimes contain multiple tags, they will be listed in multiple subjects. Question: Is there a report or CSV available for download? Yes. Subjects analytics has a CSV download available at the top of the Subjects analytics page. The same filters that you apply to the Subjects analytics page are applied to the CSV download. Now that you've learned about subjects analytics, check out one of our other Getting Started articles to get the most out of analytics for your team.